Situated in the heart of the city, the Westgate Gardens are spread across an area of 11 acres. Have a fun filled family picnic in the morning or head over for a romantic stroll along the River Stour in the afternoon. The river is home to many ducks, swans and moorhens. Sit back and absorb the tranquil beauty of the garden and its wildlife. During summers, the garden proves to be an ideal setting for open air events and exhibitions. Don't forget to carry a picnic basket filled with goodies. Bus stop after Westgate Towers. Bus stop opposite Queens Avenue. How popular is Westgate Gardens? People normally club together Canterbury Cathedral and The Black Griffin while planning their visit to Westgate Gardens. Like stepping back into a Tudor pastoral. Beautiful riverside gardens, clear swift but shallow river with punts and archways to float under. 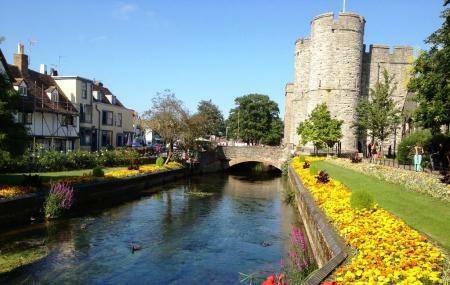 It meanders through Canterbury. Very atmospheric and just quite lovely. Wonderful place to visit in Springtime and the Summer because of the beautiful floral displays; the gentle flowing Stour river with its equatic wildlife,seeming not unperturbed by the many visitors that enjoy a stroll or,even a picnic on the grassy areas that are in abundance! If you like old ,yet well preserved architecture, you can see some good examples there. I can thoroughly recommend Westgate Gardens. Beautiful. Lovely park to go and sit by the river on a sunny day which seems to always be clean and well looked after. They had organised an easter egg hunt when we were there which was enjoyed by all (young and old!) which was definitely a bonus! The gardens are beautiful, the people who were there were very nice. The strong smell of cannabis may put some people off!